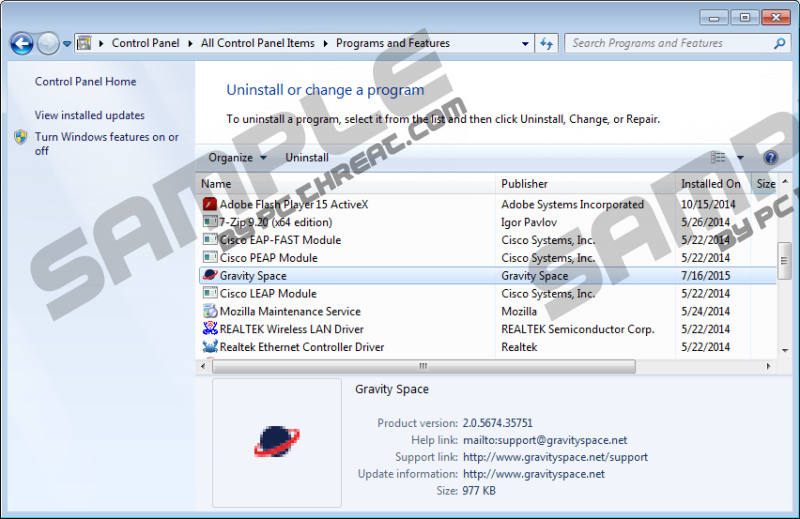 If you ever start seeing commercial advertisements on your screen, you should check whether you do not have Gravity Space installed on the system. This program might enter the system without your direct permission, so it might still be installed even if you cannot remember downloading it. Have you already detected it? If so, there is no doubt that it is responsible for all these ads. Of course, we cannot guarantee that Gravity Space is the only adware program installed on the system. It is advisable to get rid of all adware applications if you do not want to see commercials anymore. After reading this article, you will definitely understand why it is not advisable to keep adware. Gravity Space itself is created on the Injekt engine, so it does not differ from such programs as Positive Finds, Strong Signal, Roaming Rate, and Dragon Branch, which are based on the same engine. Like all the aforementioned programs, Gravity Space is going to show ads only even if it promises to open up different possibilities for you on the Internet. The majority of computer users complain that they mainly see pop-ups, shopping-offers, and coupons. They often appear on shopping websites, including eBay and Amazon. If you are reading this article, you have probably found out that ads are really annoying. Furthermore, according to our specialists, there is a small possibility that you will encounter malware if you keep clicking on advertisements. If you want to protect your system from malware, you have to get rid of Gravity Space as soon as possible. It seems that you will be able to remove Gravity Space via Control Panel easily. Make sure that you do that as soon as possible because the longer you keep it, the more harm it can cause. You will find the instructions below this article. Feel free to use them in order to eliminate Gravity Space completely. If you do not want to remove malware yourself for any reasons, you can acquire the SpyHunter antimalware suite or another security tool and perform the system scan. Make sure that you invest in a trustworthy tool because an unreliable one will cause harm to your system, whereas a reliable one will protect your computer from future malware. Click on the Start button located in the bottom-left corner. Move your cursor to the bottom-right corner to open the Charm bar. Select Search and enter control panel. Click OK. Select the application that you wish to erase. Quick & tested solution for Gravity Space removal.